Most of us see Thanksgiving as a time to express our thanks to each other and to the food before us, but its roots paints a much different image. How do we meld the tragic history of Thanksgiving with our current appreciation for each other and the food we've brought to the table? This newsletter highlights the fun ending of our 2018 summer season. Love, worth, hope and possibilities are the major themes of this newsletter. The cross-country listening tour has taught us so much about the inherent shared experiences of farmers and fishermen. Read Niaz's powerful update letter to get a sense of these common themes. Check out our 2018 Seafood Throwdown newsletter to learn more. So much news to share in this newsletter! The tour is off and after a week on the road Niaz shares reflections from her visits with communities from DC to North Carolina. The new America the Bountiful website has been launched and bandanas are flying off the shelf! Community-based fishermen and family farmers are now united through a new shared leadership model between the Northwest Atlantic Marine Alliance (NAMA) and the National Family Farm Coalition (NFFC). Our board member (and commercial fisherman) Jason Jarvis heads to the Hill to oppose offshore drilling; we're building relationships at the HEAL Food Alliance gathering in Cleveland; and participating in the first meeting of the FINE Farm to Institution Policy Working Group. *Get a closer look of the POLITICO full page ad campaign opposing offshore drilling that NAMA sponsored with other groups in the movement. This month we headed to D.C. for the National Family Farm Coalition board meeting and we're releasing our first list of Seafood Throwdown dates for the 2018 season! Check out where we'll be this summer and read up on NAMA's newest hire: Amy MacKown joins the team! What do you need in order to fight co-option of new innovations and corruptions throughout the fisheries systems? Read our latest newsletter to find out how we are working to do both. Julianna Fischer, one of our community organizers, reflects on all that has happened during her first year at NAMA, and has put together a short list of some of her favorite moments of 2017. Globalize the Revol-Ocean; Globalize Hope! Read about NAMA going to this year's World Forum of Fisher People's General Assembly in India, the US Food Sovereignty Prize, Codfather sentencing, testimony to US congress for the Fish Bill, and more. Crimes and Punishments; Codfather Sequels? 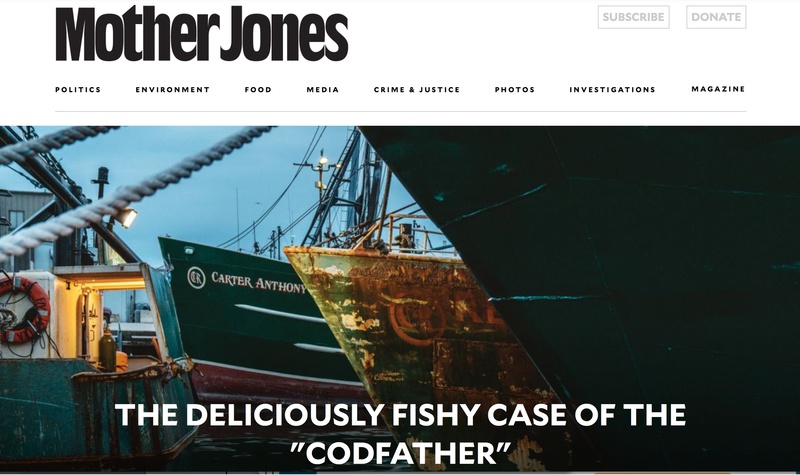 Read about the Codfather's upcoming sentencing, what we think should be done about his crimes and the policies that gave him power, and other updates like our trip to DC, Farm Aid, and the upcoming last few Seafood Throwdowns! The Codfather's sentencing, a packed Seafood Throwdown season, and growing demand for community based seafood... that's what summer is all about around these parts. Check out our latest newsletter for more details. Wine & fish dinner at Heritage in Sherborn; 2017 Seafood Throwdown schedule; leadership institute opportunities; saying no to GMO salmon; and, more in our recent newsletter with an intro from Kate Masury of Eating with the Ecosystem. Shame on National Oceanic and Atmospheric Administration's Fisheries Service for finalizing a rule to privatize, consolidate, and corporatize our ocean commons. Read this alert by our community organizer, Brett Tolley. The case of Carlos Rafael has put a spotlight on Catch Shares. Read our latest newsletter for our perspective on how fisheries policies and systems are empowering the wrong part of the fishing industry. Also, last call for Seafood Throwdowns for the 2017 calendar, and more! Thanks to all those who came to our Rock the Boat for Kathy Ozer event recently honoring her work and legacy, which clearly will be relevant for a very long time. Thanks, Kathy, for taking the words right out of our collective mouths when it comes to defining who we see as the true stewards of land and sea. We're excited to share that we'll be launching a campaign in 2017 to amplify the shared narratives of family fishermen & farmers. We planted a seed for our plan to bring our story to a wider audience this November at the Blue Mountain Center with the National Family Farm Coalition. Hear why our work is more relevant than ever and necessary to effectively heal the divides exposed by the 2016 election. We celebrate the demise of the Trans-Pacific Partnership and congratulate the fishermen, farmers, ranchers, farmworkers, fishworkers and rural communities for their diligent work for many years to protect our communities from trade agreements written by corporate insiders seeking only corporate profits. Black Lives, White House, Rays of Hope. Our latest newsletter takes you deeper into why we believe racial inequities and injustice laid the foundation for marginalization of fishing communities, bad neo-liberal policies, and the decline of the ocean. Seafood Throwdowns are fun, tasty and exciting. Beyond the cooking competition excitement they're also a way for fishermen to share their stories and expose the corporate takeover of our ocean commons. Read Brett's story of why we throw down, about our upcoming trip CommonBound, the Good Food Awards and more! At a time when success is measured by who can work at the speed of light regardless of the outcomes, we will continue to work at the speed of trust because we believe it's the only way to get the outcomes we seek for the long haul. Purpose: At the core of our strategic plan is making sure all our work helps us achieve our purpose. That's us with all our inspiring fishermen and CSF friends at the #LocalSeafoodSummit2016 in Norfolk, VA. Catch up on the conversations at the Summit. Come see our FishHeadquarters! Our board president and commercial fisherman Shannon Eldredge share why walking out of a policy process was an important decision and going to Milan to receive the Bologna International Sustainability and Food Award. Our June newsletter highlights the relaunch of the brand new localcatch.org website, where you can find a CSF near you and learn about other off-the-boat and/or direct to consumer ideas for finding local seafood. It'll also tell you about all the other things we have been up to. Check it out! Check out this month's newsletter to keep up to date on the latest in our network. From Rock the Boat to Amendment 18 and a student-led movement to shift higher ed's food system - take a peek! If we are serious about protecting the ocean, we must bravely address inequities and injustices in the system. And I hope you'll stand with us as we do. Last week at the conclusion of a Food Solutions New England meeting we were asked: how we will address issues of racial inequity and food injustice in our work? FSNE is a network of organizations, including NAMA, focused on figuring out how as New Englanders can we feed ourselves mostly locally caught, raised and grown food in a few decades while dismantling racial inequity and food injustice in our food system. A brave undertaking. My only thought at the end of the meeting was we must be brave. On the drive home I realized I was telling myself to be brave more than I was telling my colleagues in the room. Must admit I am nervous about how this commitment will further transform our work and approach. The language of today's marine conservation movement is not written with racial equity and food justice in mind. And fisheries policies are from just and equitable. So I anticipate resistance to our work. Until recently, the two worlds of food justice advocacy and ocean advocacy didn't even intersect. 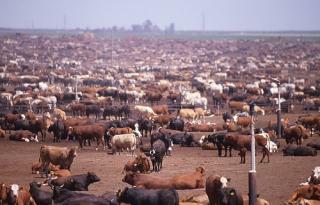 This is a shame since our excuse for killing marine animals is to feed ourselves. We already took the brave step to focus our work on linking these two worlds, and what has emerged has been inspiring and empowering. We appreciate your support getting us this far. But we need to do more - and we need you to be there as we do. Because the more we learned, the more we saw the marginalization of the communities all throughout our food system including fishing communities, often driven by race and income. Why do race and equity matter to marine conservation? Because race continues to be the major factor for how entire communities are treated, impacting access to resources and the cost of basic needs in communities of color. Race and equity are the reasons why many communities are treated unjustly or taken for granted, and often left with limited or non-existent choices when it comes to securing healthy, clean, fair food along the entire food chain. You can get a glimpse into the data around racial inequity and food injustice by visiting this link. When it comes to fishing, we see race and equity play a major role. Indonesian fishermen being held in slavery conditions off New Zealand; child labor used to grow the shrimp for Walmart; here in the US communities of color see access to seafood being limited to highly processed, boxed, and overpriced "seafood products" at the corner bodegas... all the while fishermen around the globe continue to fish under unjust price controls, fighting against corporate takeover and privatization strategies, and often ending up fishing in the red. These issues have a direct relationship with how we treat the ocean, yet they are silo-ed as human rights issues or economic justice issues. They are marine conservation issues and it's time we addressed them in that context. But we must be brave to do this work justice. Frankly, the marine conservation movement needs to change if issues of racial equality and food justice are to be addressed. Today, this movement is pretty homogenous and does not address the issues of race, equity and access. These issues are considered peripheral to saving the fish, when in fact inequity and injustice play a major role in fisheries policies and seafood value chain. It's time to change the face of the marine conservation movement, and we need your help to do that. Most of the marine conservation campaigns and messages target upper middle class and white populations. Our work is a whole new way of looking at and talking about what it takes to protect the ocean and, like any new way of approaching social and environmental change, is not always welcomed or understood. As Gandhi said "be the change you want to see in the world." Knowing what we know, it's our responsibility to create the changes necessary to ensure just and equitable fisheries and food systems. Please join us in this bold and brave approach, and stand up without fear to those who have been controlling the fishing and agriculture worlds, often at the cost to the animals, the land, the ocean and those who are working on land and sea. Thank you for helping us be brave. Was yours one of the 150-plus signatures we sent to NOAA last month? Summer is here and our latest newsletter is hot off the press. Trending this month is: our collaborative working model; the Seafood Bill (aka Magnuson Stevens Fishery Conservation and Management Act); student-led food activism that is changing the seafood market; climate change impacts; and a long line up of exciting summer of events! What Do You Think About Seafood Certifications? At NAMA we feel lucky to be able to work amongst and amidst people who are passionate and caring about healthy oceans. From the Fish Locally Collaborative folks who help guide our every step to the fishermen, community and food activists who have come together to embrace new ideas such as Community Supported Fisheries. We really feel that despite knowing that there are significant challenges in the coming year, the work that is being done will lead us to the kind of healthy ocean and healthy communities we all value. 2010 was a year to watch the seeds of 2009 sprout and become strong. Another 8 new CSF's formed, science continued to emerge supporting finer scale management, and of course we gained some traction around fleet diversity in the New England Fishery Management Council (see article below) These are just some of the things that happened with the help and support of our cohorts, conspirators, collaborators and well wishers, to all of whom we offer a heartfelt and sincere thanks. We are looking forward to another year connecting peoples and fish in rewarding, sustainable and productive ways. Have a great holiday season and New Year! A critical step forward in the battle to save the community-based fleet took place two weeks ago when the New England Fisheries Management Council voted to address fleet diversity as a priority in the upcoming year. This marks a sea-change of sorts considering Fleet Diversity was off the council’s radar as recently as last spring. The change is the direct result of many of you choosing to weigh in through your signature, testimonies and other means. The vote marks a culmination of efforts by NAMA and our partners including fishermen, food system activists, community advocates, and non-profit allies who traveled to testify, recorded video, signed our petition, and spread the message that ‘Who Fishes Matters’. Together, we worked to ensure family based fishermen and fishing communities are fairly represented and protected in the new Catch Share regime. We are forging the path toward a shared Fleet Vision and now look to the challenges ahead. The vote also marks the beginning of a much more difficult and perhaps protracted battle: How do you define Fleet Diversity? And how do you achieve fleet diversity? Based on the Fleet Vision Project, which has a clear vision statement on Fleet Diversity, and evidence from other Catch Share programs the measures we feel will ensure the diversity of the fleet include: fishing quota set-asides that invest in fishing communities, leasing policies that foster an affordable fishery, owner-operator incentives, opportunities for new and/or younger fishermen to enter the fishery, and accumulation limits. Each of these measures tackles a different aspect of a diverse fleet and ultimately will ensure an ecologically viable and sustainable ecosystem supporting an economically and socially just fishery. However no single measure in and of itself will work to ensure a diverse fleet. Ciao from Italy! Once every two years Slow Food International’s Terra Madre conference in Torino, Italy brings together thousands of players in the food chain who together support sustainable and local food systems in countries around the world. Our team from New England led a Terra Madre workshop called Between Land and Sea highlighting the critical connection between farmers and fishers. The panel featured NAMA’s Brett Tolley, Ellen Tyler and Amanda Beal (Tufts University and the By Land and By Sea Project), Lisa Fernandes (Eat Local Foods Coalition), Robin Alden and Ted Ames (Penobscot East Resource Center), and Russell Libby (Maine Organic Farmers and Gardeners Association-MOFGA). Slow Food International recently launched a campaign called Slow Fish aimed at supporting responsible fishing communities and promoting good, clean, and fair fishing. Over the course of the conference fishers, including members of the New England delegation, laid the tracks for Slow Fish’s guiding document that will shape the campaign’s direction moving forward. NAMA is working closely with Slow Fish organizers to finalize the document and help make the Slow Fish campaign a powerful tool for fishing communities around the world. Terra Madre day is December 10! Already more than a hundred countries will bring together local Slow Food networks of farmers, fishers, producers, schools, cooks, and members in hundreds of creative events to celebrate local food, with many highlighting the right to a healthy daily diet, particularly the world’s poorest people. Help promote better food systems. Join Terra Madre in creating ‘a global revolution with local roots’. Visit Terra Madre’s website to learn more. Who Fishes Matters - Preserving the health of the oceans, fishing communities and our food system. If we care about the health of our oceans, fishing communities, and our food system, then who fishes matters. But fisheries policies and regulations don’t reflect this and we’re working to change that. In New England, the groundfish fishery is transitioning into a new ‘Catch Share’ management system, with its promises to improve ecological stewardship of our oceans. However, we know that uncontrolled ‘Catch Share’ programs haven’t taken into account who actually fishes for our seafood. Instead, around the world Catch Shares have consolidated the fishing industry into monolithic, industrial scale, absentee owner fishing fleets. We believe this direction undermines communities, ecosystems, and our food system. Trickle Up or Trickle Down? National Ocean and Fisheries Policies: Trickle Up or Trickle Down? Our inbox raneth over in response to our last newsletter "Eat Local Seafood." So much so that we couldn't respond to all of you individually. On everyone's mind seemed to be the question "what seafood should we eat? " In another words, is there such a thing as "green" seafood? One's taste for seafood is often dictated by culture, geography, religion, tradition, income, and, of course, taste. Whatever your reason for wanting seafood, we at NAMA are not a big fan of declaring any specific seafood "green." Too often many factors that can help determine the "green-ness" of seafood are ignored in the attempt to make it easier for us to make purchasing decisions at the cost of the oceans and those who catch the seafood we eat. But Atlantic herring is a critical part of the diet of many recovering marine animals living in the waters off of New England. Herring's population rebounded after being over-fished by factory vessels off the coast of New England in the 60s and 70s. But many of its predators' populations have drastically declined due to a variety of environmental stresses - including overfishing. Unfortunately, fisheries managers seem to look at the ocean as a body of water full of single species of fish we like to eat rather than an ecosystem. But it takes an ecosystem to save the oceans or single species of fish pleasing to our palates, so the relationship between the predator and the prey - such as that between herring and its many predators such as cod or whales or seabirds or bluefin tuna - need to be accounted for properly when management decisions are made. This lack of accounting is one of the many flaws of fisheries management policies today. Even worse, food fish like herring are usually small, economically low-value fish which means a lot of them need to be caught to make catching them profitable. As a result, they lend themselves to industrial-style, factory fishing operations. Herring's history alone tells us that is not good for the fish and the rest of the ocean - not to mention the coastal fishing communities waiting for many of herring's predators to rebound to an ecologically sound and economically sustainable levels. Herring is just one example of the complexities involved in declaring a particular seafood "green." We believe the more we know about what happens to the fish that end up on our plates the more likely we are to get involved in the policy level changes that need to take place to ensure that the oceans are healthy enough to continue feeding us - and all the other creatures that feed on the seas - for generations to come. Get involved in a Community Supported Fishery (CSF). NAMA is actively working to create CSFs in New England and provide the basic tools to fishing communities in other regions interested in staring a CSF. In addition, we are working to broaden the market for CSFs and other fishing community-based seafood marketing efforts by building connections between these organizations and sustainable, regional markets through working with chefs, restaurants, co-operatives, farmers' markets, local food enthusiasts and Community Supported Agriculture (CSA). Coming soon fishermen or consumers looking to start a CSF can find all the tools they need in our upcoming CSF Bait Box. We wouldn't have to think this hard about what we eat from the seas if policies and regulations were ecosystem and community based. NAMA believes that through a grassroots movement of fishermen, fishing community organizations and those who eat their catch we can transform today's fisheries policies towards ones that recognize the oceans are complex ecosystems and not bodies of water that magically produce single species of fish that pop onto our plates. And, who catches what does pop onto our plates matters. Allocation caps are a proven means to prevent the kinds of consolidation that are a hallmark of Catch Share programs, the most egregious example being the Mid Atlantic Ocean Quahog/Surf Clam fishery where uncontrolled consolidation resulted in around 90% of all permits being owned by two banks. Quota owners were effectively able to control how, when and how much fish was brought to shore and the price paid to the fishermen. This was also the case in some of the Alaska crab fisheries. Allocation caps simply prevent one person, corporation, or entity from gaining unfair leverage over markets, pricing, and the political process. Policies addressing leasing of fishing rights should foster an affordable fishery not one where leasing leads to consolidation of the fishing fleet and aggregation of fishing rights by a few fiscally-powerful players. 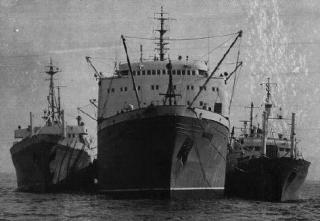 Leasing restrictions existed under the previous management system called Days at Sea, which effectively controlled the flow of leasing between classes of boat sizes. For example, a 90ft. boat could not lease from a 40ft boat. Currently there is no such leasing policy under Catch Share management. Such policies can help protect a diverse fleet as well as maintain the cost of leasing at an affordable rate. The key is to design such policies with an eye toward preventing gross consolidation and concentration of fishing power while at the same time allowing enough flexibility for fishermen to trade fishing quota as necessary, and enter and leave the fishery without devaluing their permits. Ensuring younger fishermen have an opportunity to enter the fishery. Enabling Owner/operators, crew and captains to maintain reliability and dedication to stewardship and safe fishing standards while providing security. Quota set aside for adaptive management to enable adjustments to new scientific information and thereby helps achieve ecosystem goals. Conservation set-asides to reward ecologically sound fishing practices with additional quota (not to exceed accumulation limits). Research set-asides, which are already options in the New England management system should remain so. Lastly, owner-operator incentives are a way to ensure that fishermen are the primary holders of permits as opposed to banks, financial speculators and absentee quota holders. Other Catch Share programs with no owner-operator incentives resulted in a “tenant” fishery, where the majority of permit owners lease their rights to fish and the majority of fishermen on the ocean rent their rights to fish. Experience tells us that a sea-tenant fishery undermines community values and ocean stewardship. The above measures are just a few and we are actively working with and learning from communities who have adopted similar or additional measures to ensure fleet diversity. None of these measures in and of themselves will prevent excessive fleet consolidation. In fact, in many Catch Share programs where only one or a couple measures are put in place industrial fishing operations have been able to sidestep the restrictions. In the worst-case scenario, such as the Ocean Quahog/Surf Clam, fishery managers are now trying to retrospectively clean up the mess. We can learn from others’ mistakes. Here in New England the NEFMC has the opportunity to be proactive, ensure we don’t head down the same road as the Ocean Quahog/Surf Clam, and their recent vote was an important step forward to secure a just and sustainable fishery, but much work remains. We’ll be looking for more testimonies, video or in-person, to support maintaining and preserving a diverse fleet and moving towards a shared fleet vision. Allocation caps are a proven means to prevent the kinds of consolidation that are a hallmark of Catch Share programs, the most egregious exam ple being the Mid Atlantic Ocean Quahog/Surf Clam fishery where uncontrolled consolidation resulted in around 90% of all permits being owned by two banks. Quota owners were effectively able to control how, when and how much fish was brought to shore and the price paid to the fishermen. This was also the case in some of the Alaska crab fisheries. Allocation caps simply prevent one person, corporation, or entity from gaining unfair leverage over markets, pricing, and the political process. If we truly care about our oceans and our fisheries, then "WHO" fishes matters! The New England Fisheries Management Council has made clear that fleet reduction is a priority in order to reduce total catch. However, a Council vision for who staysand who goes is absent. We learned from the experience of US farm policy that consolidation without a vision resulted in large-scale factory farming corporations driving out family farmers and degrading the land based environment, biodiversity, and security of the food system in this country. As it did this, it also destroyed the fabric and vitality of farming communities in the heartland. Consolidation without a vision could result in a small fleet of homogeneous large-scale boats that fish from only a few ports and use a narrow range of gear types, scale and sizes. We know fisheries around world that have consolidated without a vision didn't achieve the ecological outcomes promised during the process. The Council needs a vision that reflects what we have learned to date so we do not repeat the same mistakes again. "A geographically distributed commercial and recreational fleet that includes all gear types and boat sizes. Clearly the community values and understands the need for many different boat sizes and gear types that provide diverse products to markets. The community strongly dislikes the possibility of a fleet that is consolidated either by ownership or geography, and participants in this project advocate many jobs and coastal community welfare over economic efficiency." Tell Council that you support the Fleet Vision Project that calls for a diverse fleet by taking the PLEDGE. 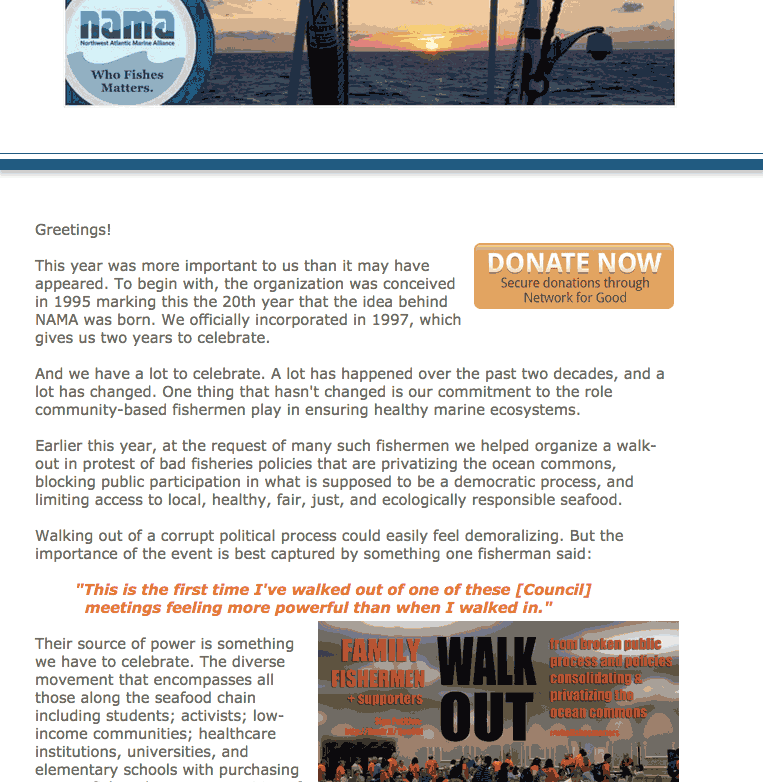 NAMA along with a team of fishermen and non-fishermen will be carrying your message to the Council this June 23. We need your support! If we truly care about our oceans and our fisheries, then “WHO” fishes matters! The New England Fisheries Management Council has made clear that fleet reduction is a priority in order to reduce total catch. However, a Council vision for who stays and who goes is absent. We learned from the experience of US farm policy that consolidation without a vision resulted in large-scale factory farming corporations driving out family farmers and degrading the land based environment, biodiversity, and security of the food system in this country. As it did this, it also destroyed the fabric and vitality of farming communities in the heartland. Consolidation without a vision could result in a small fleet of homogenous large-scale boats that fish from only a few ports and use a narrow range of gear types, scale and sizes. We know fisheries around world that have consolidated without a vision didn’t achieve the ecological outcomes promised during the process. It could have been that magic moment when a sea worm on a hook lowered into the sea results in a shiny wondrous living fish flopping around on the dock. Or it could have been a deep affection for the proud nosed workboats that cluttered the harbor in my youth, each telling a story by their wear and tear and the condition of their paint. It could have been one of those moments or a collection of a thousand fleeting glances at the ocean, a seemingly involuntary need to see it each day and register its temper. I still don’t know how or why the ocean gets into one’s blood, but I do know when it gets there it stays there. During my college years, living in Portland, OR, a true deepwater port but 100 miles from the ocean proper, a constant longing for the intimate shores of the New England coast dwelled within me. It pained my mother to hear that I missed the ocean more than her cooking. Like many who live and work with or near the ocean, I tend to think of the ocean as a living thing, which sounds obvious to say, but I mean it, as the young are wont to say, as my BFF, or Best Friend Forever. Growing up fishing the shores of Salem Sound I saw the end of the Russian factory ships that hovered outside Gloucester Harbor scooping up anything and everything from the ocean. I saw Cod disappear and now take pleasure in their return to numbers. I never even knew what a wonderful fish the Striped Bass was as a child, and now they are back in their place in the ecosystem. I have also watched as year after year the number of fishing boats in my homeport of Marblehead dwindled. Like their prey under the waters their numbers have ebbed as fish became scarce and regulations became plentiful. Along with the dwindling fleet comes a more subtle yet pernicious loss to the culture of the town, the loss of a connection to our surroundings that not only is part of our history, but should be part of our present and future. And, for me, most troubling is that the local market, not 200 yards from the fish pier, sells cod and haddock from Iceland. NAMA likes to ask the question, “If we truly care about the health of our oceans does it matter how, where and when we fish; and, who catches the fish that end up on our dinner plates?” Of course we believe the answer is a resounding yes. It is one of those questions that are just beyond rhetorical, as most people will answer, “yes”. It is really the consequences of answering “yes” that is the purpose of the question. Once you admit you care, don’t you have to do something about it? If you answer the question “Yes” do you still buy the cod and haddock from Iceland that is at least a week old – and even worse, its not any cheaper than you could get locally caught much more fresh fish? If you answer, “Yes” don’t you have to value a fresh local product more than a lower quality imported one? Despite the problems, there is a sea change happening. People who care about their food are starting to include seafood in the discussion. Cod stocks are rebounding in many of the inshore areas that our local day-boat fishermen can find them. In fact, fishermen are more concerned now about catching their quota too quickly than about any lack of fish. Also, in what seems like an obvious step, regulators are now no longer requiring fishermen to throw their “by-catch” overboard. Fishermen are happy about this. They never wanted to kill anything from the ocean they could not land. CSF’s are showing that people care about seafood. CSF members literally gush about how good fresh locally caught fish is, and revel in their experiences eating fish that are almost impossible to find at the local markets (even the best fishmongers are not carrying Redfish, a local stock well rebuilt, great for grilling, excellent tasty white flesh). All of these things are positive steps but there is still a lot of work to be done. Concerned locavores (those who prefer their foods to be locally grown) are asking the hard questions about sustainability and gear types, things most consumers would not think of asking even a few years ago. The answers are not black and white (or the only slightly less oversimplified red, yellow and green). The answers are far more subtle and nuanced. Finding ways to get this message out will take time and co-operation from fishermen, shore-side workers and consumers. For example, yes, some Atlantic Cod stocks are still in deep trouble, however our local Western Gulf of Maine stocks are expected to be listed as fully rebuilt in the coming years. Yes trawl gear can harm the ocean floor, but does that necessarily make trawl fishing a bad gear type? Again the answer requires developing an understanding of how fishermen have modified their gear to not only limit by-catch and reduce damage to the ocean bottom, but to effectively catch a targeted species quickly resulting in higher quality. The latest bogeyman for fishermen are new rules that aim to reduce the fleet even further, and are likely to end up consolidating the fleet. If that doesn’t sound too bad, think what has happened to our family farms. Do you really want multi-national corporations being the stewards of our local seafood? As people learn more, hopefully they will see that just outside our doors is one of the most precious resources in the world: a source of healthy, wild food. (You know how many people in the world would kill to be able to say that?) And maybe, because they care about their food, and they care about their communities they will start demanding that the local store buy fish from local dealers, that the town’s maintain the infrastructure that allows a day boat fishermen to land his catch in Marblehead. And maybe again someday the harbors will be filled with freshly painted colorful fishing boats, their noses pointing into the wind proudly and defiantly announcing that we are a people that are part of our environment. Make no mistake; the Gulf of Mexico ecosystem is broken, perhaps beyond repair – certainly beyond our ability to repair it. If somehow the shattered pieces come back together again, it’s pretty certain it won’t look or function like it did before the spill. Many who don’t live along the Gulf coast will probably have forgotten what that was like anyway. But those Louisianans, Arkansans, Mississippians, Alabamans, and Floridians, Texans (and perhaps others) whose health, livelihoods, and happiness are destroyed by this event will not soon forget. Can we help our fellow fishing communities? Can we prevent similar disasters from happening in the future – there and here? A vision for the future, along with a clear vision of the past might help. It’s almost impossible for us to comprehend what is happening in the Gulf. Even those who live there must rely on television and the internet to expose the shear magnitude – the depth, breadth, and non-stop gush of oil, the windrows of petrol-gunk, the struggling and dead birds, and models that depict the drift of underwater plumes. But while the images are ephemeral, the oil is not. We may never know the full scope of damage nor ever see what’s happening to the diversity of life beneath the sea-surface. In this, as in so many of our overachievements, man is powerless to stop what he has wrought. To add insult to injury, the government and BP insist on presenting us with information like how much of the Gulf is still open to fishing, how many boats and booms have been deployed, how fishermen are earning money as BP hires them for response efforts (not mentioned, at the expense of their health). We should not tolerate such spin put on such a grave situation. Does memory already fail us? The history of ecological trauma in the Gulf of Mexico does not begin with this oil spill. There was already a large lifeless hypoxic area (deprived of oxygen) fanning out seasonally in bottom waters at the mouth of the Mississippi River. One can only wonder what synergism may be occurring between that and the oil drifting shoreward. And many years of daily inundation of petrochemical tainted tides, rain and air have taken major tolls on bayous and other wetlands -- the result of emissions from a variety of oil-based industries on the Gulf. More than half the Gulf’s productive wetlands were already lost to draining, dredging, logging and development, and now this oil. Do we have any idea what the Gulf and its ecosystems were like long ago when they were truly healthy and diverse? Some historians and natural historians do, and it’s something to strive to recover. We must hold on to our history if we are ever to know how to envision our future. How easily we adjust to the slippery slope of ecological decline. It’s all around us and we simply adapt. But before we adapt we should learn to anticipate and avoid. There isn’t a contingency plan on earth that can recover more than about 10 percent of an oil spill. And if it includes dispersants, the recovery rate is even lower. So it’s time to stop blaming over the failure of an appropriate response and start complaining about the failure of prevention! We should ask our legislators, regulators, fisheries managers and the like to work with citizens to develop a clear vision of what we want our communities, our land and our seas to look like in the future and to find fair and effective ways to get there using the best knowledge-base available. If we demand that, however, we must also take on the responsibility of adjusting our own personal lifestyles to help make it happen. Yes, the government has to change the way it operates; but we have to change the way we live in order to preserve or achieve the diversity of life and thriving communities we value. That may be the hardest part of all. Behavior change doesn’t end with energy conservation and reduced oil consumption, which is a big enough job. We also must reevaluate our use of manufactured chemicals, how we farm, how we build cities, and how we use the ocean. Fishermen, who rely on healthy fish populations, understand the consequences all too well, for the ocean receives the outfall of all bad environmental decisions. If we needed proof that humans are part of the marine ecosystem as well as the land, the Deepwater Horizon has provided it. We must realize we can’t put complex things like the Gulf of Mexico ecosystems back together again, even with the help of all the king’s horses and all the king’s men. We have to prevent them from breaking in the first place. From the conception of CAFC, where even the most optimistic hoped for 100 members, to the sometimes overwhelming yet insanely gratifying reality that well over 1000 people have joined this noble experiment, it has been a wild ride. And truly the biggest thanks goes to you the CAFC shareholders. Without your support, forbearance and enthusiasm none of this could have happened and all of us at CAFC want to make sure you know just how gratifying it is to be partners with all of you that has exceeded all of our wildest hopes. Not everything has gone perfectly. But rest assured we are listening.